A few months ago, I put a request out on the 7 Day Startup (Open) group for a marketing funnel setup for my 7 Day Startup Pro community. Richard Patey from Funnel Engine emailed straight back and I got him on board to help me set it up. In this post I’ll run through exactly what we did and the results we got. As a bit of a backstory on my community, I’d always thought communities were a very difficult business model (still do). I tried one 2 years ago and while I was able to get some initial members, I wasn’t able to keep new members coming through. After a few months, the members churned and it was dead. I was testing a few things with 7 Day Startup Pro from an online community point of view. Can I do an online community that doesn’t rely on what I call the “Guru Model”? This is where everyone in the membership just wants access to the site owner and it puts enormous pressure on the site owner to respond to every thread. I have experienced both so I knew this was possible depending on how the group was marketed. Can I build a membership that doesn’t have content inside it? Almost every membership I can think of sells exclusive content as one of the benefits. But I believe the best content is free and I get much more excitement out of creating free public content (like The 7 Day Startup Challenge), than I do creating exclusive content for a small group of people who may or may not really need it. I also feel content isn’t the best solution to problems a lot of the time (although it’s sold that way) and I also worry about the team required for ongoing maintenance of the content. I wanted to see if we could make the “Freemium model” work for the community. I had my free open 7 Day Startup Group, but could we convert any free people to paid people? Freemium is notoriously difficult to pull off and I wasn’t aware of too many successful examples in online communities. I wanted to manage churn and give myself a reasonable run at success by only offering annual membership. Again I wasn’t aware of any other communities in the space doing this. But I know how much a killer churn can be, particularly when it’s as public as it is in a community (Everyone knows when someone leaves). And of course I launched the community in 7 days because…. duh! So in short, the whole thing was pretty experimental. One thing I knew for sure, I was going to have to get ongoing members into the group if it was going to work. Getting initial members wasn’t too difficult, with my social media presence, free group and email list of 13,000 people. But where to from there? At the time I was using Mailchimp for the broadcast emails and basic autoresponders however I wanted to set up dynamic email sequences that could move people between campaigns. For WP Curve we use Infusionsoft which does everything, but it was overly complex for what I needed here. With this project, I wanted to give away the previously paid video course for free as a ‘lead magnet’ and then deliver the course as a series of emails, each going to a separate video landing page. The final email in the sequence would then be a pitch email to encourage people to sign up to my paid community 7 Day Startup Pro. Whilst Mailchimp does have automation, each automation is separate and tied to one list; you cannot move people between automations if they were to click a link or download a book. As such, automations in Mailchimp are how Richard from Funnel Engine describes static whereas campaigns in something like Drip or Active Campaign are dynamic and people can move between them. I also wanted to make sure that if someone had already joined the paid community they didn’t receive the final pitch email when going through the paid course. For example we mention the paid course as a “ps” throughout the series and some people choose to pay before finishing the free course so it would be annoying to send an email asking someone to consider signing up when they already have. After conversations with Richard and my friend Rob from Drip, we agreed to move across from MailChimp to Drip and Richard and Rob both worked together on that process (Rob’s support was very hands on and first class, Richard’s work is detailed in this post). The first step was replacing the 7daystartup.com homepage with a new landing page to give away the course. Previously it just talked about the book. We built out the free course offer using my existing OptimizePress and using their “overlay optimizer” so we don’t need to put an email box on the actual landing page. We just put a button and when someone clicks a button, a popup appears to enter their details. It has been proven time and again that this 2 step optin process converts far better than having the form already visible on the page. We built 2 landing pages. One large one that became the homepage, and a smaller “squeeze page” which we used when promoting the course off site. Here is a link to the full landing page. Here is a link to the shorter squeeze page. *Note because I’m currently running the 7 Day Startup challenge, the longer landing page is not currently set to be the homepage. But I’ve adopted a similar strategy for the challenge, so you can check out the challenge landing page on the homepage. OptimizePress makes it easy to duplicate a page and make some tweaks to it. Once you have one of these pages, you can have another one in minutes. Here is how it looks before and after clicking the ‘Get The Free Course’ button. Here is how it looks after you click the green button. OptimizePress enables you to achieve this, and it has a small one off fee as opposed to an ongoing subscription (I love OptimizePress). In addition to this, we set up a smaller squeeze page on 7daystartup.com/free. This page achieves the same thing but it’s for people who are coming to the page knowing exactly what it’s for and it needs less of the contextual content that we have on the main landing page. And on top of all of that, we duplicated the same thing for my contentmachine.com site with my Content Marketing course. Here is what the campaign structure looks like in Drip. We have 3 separate campaigns. The first is the course campaign which has 8 emails within it and which over 1,800 people have gone through. When someone signs up on 7daystartup.com they get dropped into this campaign and when they choose to join the paid community they get tagged as a paid member through an integration with Stripe when they signup to the payment plan. This is managed via an inbuilt Stripe integration inside Drip. The above integration tags them and this automation adds every tagged person into our campaign sequence. Then finally to move people who hadn’t yet paid into the pitch email sequence (which had just one email) we added the automation below. The clever part comes to make sure that only people without that tag receive the final email pitch.We created a custom segment of people who had completed the course AND who were not yet a paid customer which you can see in the bottom left hand corner. After the pitch, when people pay to join the community they receive a 7 part paid member campaign. Here is an example of a subscriber who has been through the entire process as designed and come out as a customer. Note it’s in reverse order so the process starts right at the bottom. This is a screenshot from Drip. Over 1,800 people have signed up to the 7DS training course so far which in itself is a great result. But the real test was whether or not I was able to grow the membership. When we started we had 34 paying customers. Since we launched the video course we’ve had 52 more members join. I haven’t done any content in this time on the site but I have promoted the group inside my free Facebook group and social media accounts. 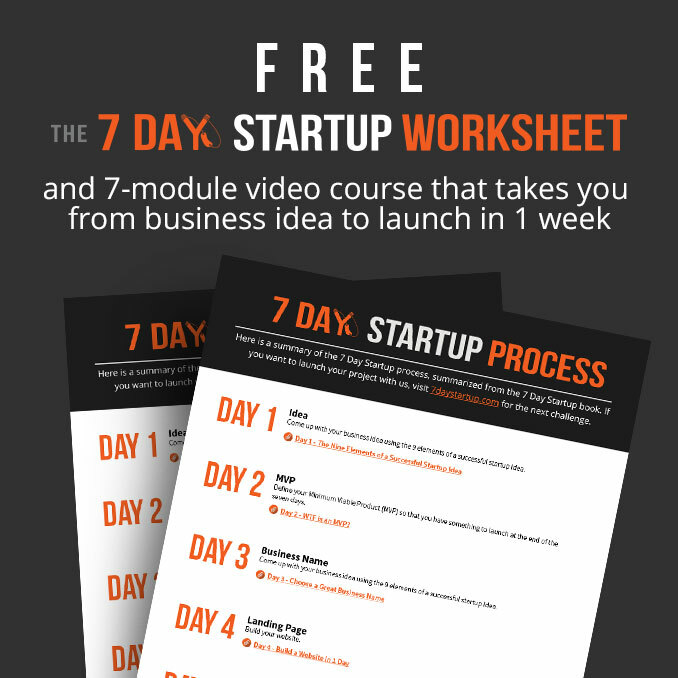 Using segments in Drip we can work out that 24 paid customers have been through the 7 Day Startup video course. And we can work out specifically that we had 16 people become a customer directly from the pitch link in the sequence. These things tend not to be linear though so I don’t really pay too much attention to these stats. I think most members hear about the group in a variety of ways and this method gives us one way to sell it to people directly. If you have any questions, please feel free to ask them via this thread in my open 7 Day Startup Facebook group. I’m running a challenge in January with 14 world class online entrepreneurs. It’s free and you should join. Check that out here. Here is a link to the 7 Day Startup Training course and here is a link to my free open Facebook group. If you want to check out Drip, visit getdrip.com (tell Rob Dan sent you). If you want to chat with Richard from Funnel Engine, visit funnelengine.com (tell him Dan sent you).